Two Emergency Air Men (T.E.A.M.) is a new concept for rapid rope access aerial emergency response. When such air men have a job to do on the exterior of super highrise building, they have to get there ASAP. 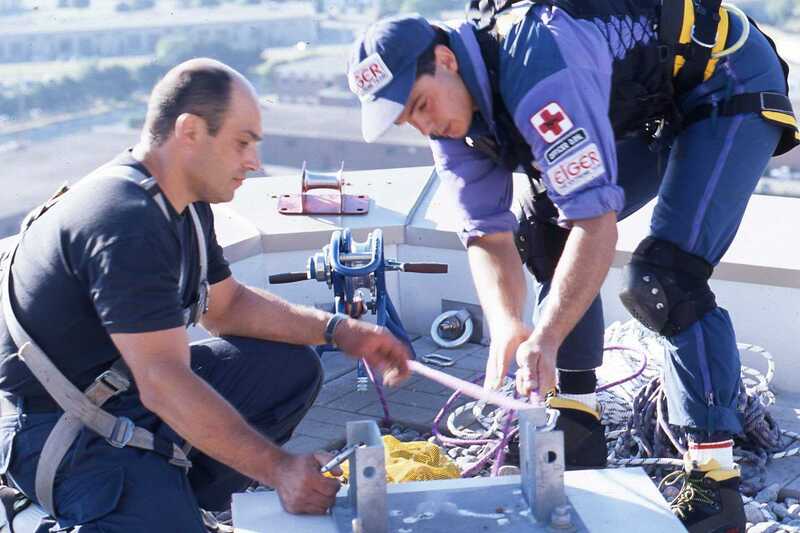 From the experience of Ivan Kristoff on the world’s tallest tower and building in 2003, it was concluded that a two-men working unit is the most efficient way of conducting high risk rope access at extreme heights. It is a way for small rescue team go get quick and respond in a rapid deployment from a helicopter. For aerial operations the team consist of a pilot and a rope rescuer. For high-rise rope access work the team consist of rope access technician and a professional fireman. Up there, especially in confined space as in the case with the Antenna Mast (on top of the CN Tower), there is no room for too many people dangling on ropes and doing a job that only one can do. Therefore, the most dangerous job would be done by the the leader of the T.E.A.M. (T.E.A.M.-Leader), and his partner would be concerned for the extra safety aspects and back up. 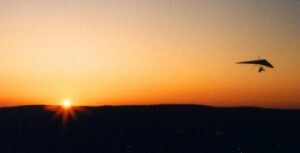 The T.E.A.M.-Partner is also responsible for assistance and other operations supporting the leader and rescue mission. Every TEAM consist of two indispensable and multi discipline specialties of highrise emergency and rope rescue. Depending on the crisis situation, emergency call and priority of provisions of rescue , the team decides, who will be the T.E.A.M. Leader. 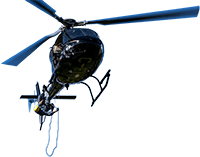 This concept was first tried out in 1997 when Kristoff hired a Toronto based helicopter company to do a series of training sessions and world records for rappelling and ascending on a rope by an EUROCOPTER twin engine helicopter. Later, the City of Toronto hired Ivan Kristoff to showcase his concept in six different ways. A few years ago, Ivan develops and simplified this concept on an ENSTROM single engine helicopter. This year, he tested his aerial video and photo monitoring on the light aviation in tandem: Hot air ballooning, motor paragliding and hand-gliding. Two Extreme Air Men – T.E.A.M. Ivan Kristoff and Ilia Valkanov are joining forces to conduct a new dimension of motor hang gliding… They are working together on setting up and execute an innovative concept for aerial operations and a world record in handgliding. What comes from a combination of a paragliding pilot and a hanglider pilot? Innovation in every aspect of the word itself. As Ivan Kristoff says it: “Man name comes from the word InnoVAtioN. 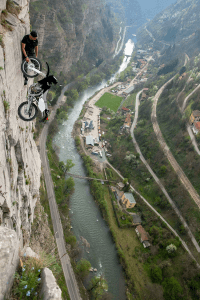 This is why I want to do something that has never been done in the hangliding and paragliding sport. And I am very confident that with Ilia Valkanov, I can do it in the air”. The two pilots are very highly experienced professionals in their field. By joining forces, they will showcase a new way of flying with a hanglider. Video: Going upside down… a few hundred meters above the ground – 90 degree of total madness:) This is part of the testing of NIKON lens perspective for video monitoring equipment of Air Search and Rescue. Ivan and Rosen Kasabov of Club EXTREME are exploring the new concept for hot air ballooning. Club Extreme introduced the world of hot air ballooning to the students of New Bulgarian University. They experienced a new concept for the ballooning sport. Two photographErs for Aerial filMing – T.E.A.M. Suzana Teofilova was our TV reporter. She is a skydiver and a student, majoring in Mass Communications at NBU. Thirsty for new experiences and emotions, she likes traveling and various extreme and not so extreme sports. She speaks Bulgarian, English and Greek, and currently studies and Spanish. Lazar Goushev is our videographer and photographer. Hi has resided for fourteen years in LA, USA, where he worked in the Hollywood animation industry as a layout designer for Disney, among other companies. Lazar is regularly featured in Bulgarian magazine editions of Amica, Cosmopolitan, Eva, Elle, FHM, Gia, Grazia, Glamour, Harper’s Bazaar, Madame Figaro, Max, and Moda. Two , one experienced with paragliding and the other with motor paragliding, will join forces to do what no one has done in the air. This will be part of developing a concept for utilizing the light aviation for Sear and Rescue. Ivan Kristoff and friends will start testing the concept in the spring of 2013. For this purpose, Kristoff and Venelyn Staykov introduced the members of Club Extreme of the New Bulgarian University to the world of light aviation. The tested the aerial photography and video equipment on various points of the motor paramotor.